Tips for drying garlic before storage for best results. How to air-dry or dehydrator-dry garlic for long-term storage. 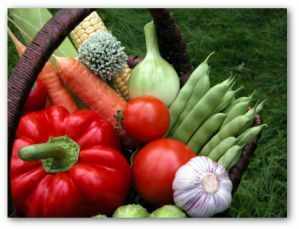 Drying was one of the earliest methods used for preserving food from bountiful harvests to use when food was scarce. Dried foods are convenient to use and can be quite tasty. Drying is the simplest and most natural way of saving the bulbs or cloves to add flavor in home cooking. 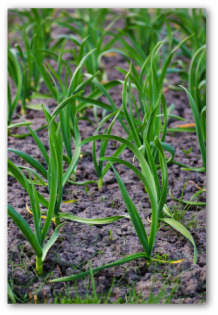 Although very little equipment is needed for drying garlic, climate is important. If you live in a warm, dry area, all you need is some extra time on your hands and fresh garlic. For folks living in a relatively moist region, using a food dehydrator may be your best choice for drying. The quicker food dries, the better its characteristic taste when it is cooked. 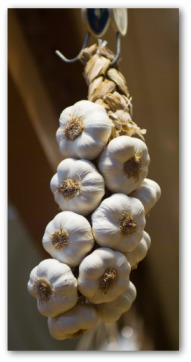 The finished product can only be as good as the original, so begin with the very freshest high-quality garlic. Removing all the moisture from food stops the growth of organisms which cause food to spoil. Properly dried foods have about 90 percent of the water removed. Depending on the storage temperature, you can count on keeping your home-dried foods for around six months to 2 years. You can make air-drying equipment from old picture frames or window screens. Clean the frames with soap and water and then seal them with mineral oil. When using picture or window frames, stretch a 100 percent cotton sheet, or heavy-duty gauze fabric over the frames and secure with a staple gun. If using old screens, there is no need to replace the screen with fabric. When air-drying, bulbs should be lifted on a rack off the floor in dry weather and permitted to dry in a warm spot for as long as possible. 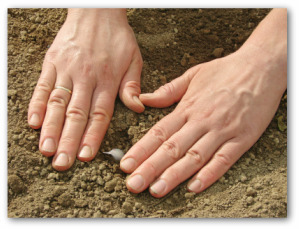 Then the bulbs should be kept frost free in airy conditions. The traditional method for drying bulbs of garlic is to hang the bulbs in net bags from the ceiling of the potting shed. However, hanging them in the basement or garage serves the same purpose as well. After peeling the cloves, cut into thick slices. Arrange the sliced garlic on the sheet, and then place the frames out of the direct sunlight. Bring the frames in at night to prevent dew collecting from on them. Turn the garlic over after several days. Continuing drying for another couple of weeks. Drying is a safe and simple technique of keeping the uniquely flavored bulbs on hand indefinitely. Cut garlic in thin slices. Try to keep the pieces uniform so each piece will dry at the same rate.A food processor works well for this step. Dry the garlic until crisp. Using a food dehydrator you can choose to dry foods hot and fast or cool and slow. In a food dehydrator, we suggest drying for two days at the lowest temperature setting. Using a blender gives you a mix of garlic granules and powder which can be separated with a coarse and fine sieve. A coffee grinder that is not being used for grinding coffee is handy for turning flakes into garlic powder. Keep drying bulbs of garlic away from fruits such as apples or pears because the odor may taint them. 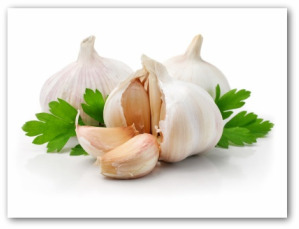 Dried garlic can be kept at room temperature in airtight containers. Also, dried garlic tops can be braided, and the braids hung in a cool dark place for storage. After drying garlic, it can be kept amazingly fresh for over a year by storing dried flakes in the freezer, and then grinding near the time you plan on using them.